Pump it up with Cycling Active Gift with Subscription! To stay healthy we need to exercise regularly. Exercising outdoors can keep our spirits high while we burn off some fats. Cycling has been a popular option when it comes to outdoor sports. It can be considered as an extreme sport or even a recreational activity. For more cycling tips and advise, check out the Cycling Active Magazine! It is an all-new UK based magazine for today’s bike rider! As its title suggests, this magazine brings your daily work out routine outdoors with Mother Nature! It is loaded with news and advise from cycling experts! This magazine is definitely one that shouldn’t be missed by people who love riding their bikes.Currently, Cycling Active Magazine is offering a bag as a free gift with subscription for every successful magazine subscription! 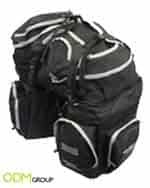 This gift with subscription is an Outeredge Pannier Large Triple bag that is suitable for bike riding. It is especially convenient to use for nature rides or even mountain biking! This bag has a high utility value as it allows bikers to carry 40 liters of water. It allows you to bring water everywhere and keeps you hydrated while you are out for a long bike trip! Why is it a brilliant gift with subscription! ODM likes this gift with subscription because it is a very practical gift for Cycling Active’s magazine readers. While choosing a gift with subscription, it is utmost important to choose something that is practical and suitable for your target audience. In this case, the water carrier bag definitely matches the needs of their readers! As a result, subscribers would definitely appreciate it and use it on a regular basis. How could other companies adopt this idea as well? Companies who are in the health or fitness industry as well can consider this gift with subscription as one option to attract customers! Besides that, to boost brand recall and brand awareness your company could imprint your brand name or logo onto these gifts! This reminds your customer of your company long after they have received the gift! And subconsciously, they will continue to support and purchase from your company. Alternatively, companies can consider using this running sports bottle or sports towel as promotional gift!